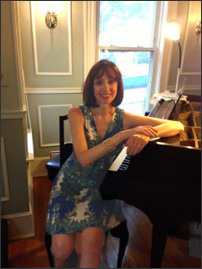 Composer/lyricist and co-librettist Miriam Raiken-Kolb is a native of Buffalo, NY, and a graduate of Oberlin College. While pursuing an acting career in NYC she began to write music—including the first songs for a full-length musical, Sara Crewe. Relocating to Boston, Raiken-Kolb joined a workshop, the New Opera Musical Theatre Initiative (NOMTI), headed by composer/lyricist and Berklee professor Michael Wartofsky. 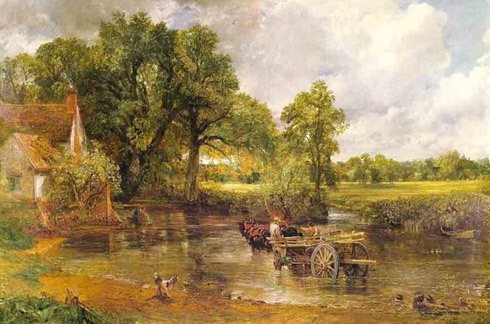 It was there that she met the playwright Elizabeth Ellor, with whom she completed Sara Crewe. Based on Frances Hodgson Burnett’s children’s classic A Little Princess, this work received its world premiere from Needham Community Theatre in 2007 and a 2008 production at the Blackwell Theatre in Atlanta. Sara Crewe is published by Dramatic Publishing Inc.
Miriam Raiken-Kolb’s other works for the musical theatre include a full-length adaptation of another famous Burnett work, The Secret Garden, and a one-act two-character musical about Emily Dickinson, I Dwell in Possibility. She has also composed an adaptation of Lewis Carroll’s Alice Through the Looking Glass. She lives in Somerville, Massachusetts, with husband Roger Kolb and daughter Gwen. 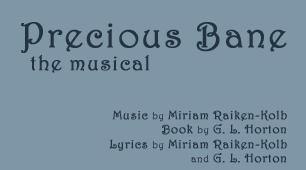 Precious Bane, based on the celebrated novel by Mary Webb, is the fruit of Raiken-Kolb’s collaboration with New England playwright G.L Horton. She and Horton would like to thank the Advanced Writers’ Lab, an outgrowth of NOMTI, for the opportunity to develop this work, and for its patience and wealth of sound advice. Playwright/actor G.L. (Geralyn) Horton was born in Toledo, Ohio and raised in a small farming town near by. Horton began her education as a theatre major at Ohio University, but eventually graduated with a BA in English from the University of Colorado and an MA from Goddard. Her first libretto was for The Golden Apple Tree, with composer Ross Dabrusin, who was the music director of the touring children’s theatre she performed with in her 20s. Dabrusin also wrote the songs for her T Show, which was given a New England tour by the People’s Theatre in Cambridge MA. When her collaborator immigrated to Canada, Horton took up residence with the Arlington St. Church’s Light Opera Company, where she performed and directed musical theatre for 20 years and collaborated with organist John Woodworth in chancel drama and multimedia Worship. 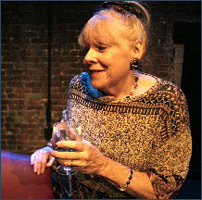 In 2001 Horton wrote the libretto for a mini-opera, Lullaby, set by Robert Bonotto, which was performed by Emerson students in the Boston Theatre Marathon, and Playwrights’ Platform did her musical Sarah of Wasilla at Turtle Lane in 2009. A few years ago Horton began to attend open meetings and presentations at NOMTI, hoping to find a composer/collaborator for one of the 6 librettos she has published on her website, Stagepage.info. She didn’t: but she found Miriam Raiken-Kolb, and fell in love with Mary Webb’s book and the music the composer was writing for its theatrical realization. Working on this, and with NOMTI, has been a joy that could only be exceeded by seeing Precious Bane reach its full potential on stage before an audience.